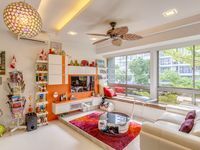 Property 42: Walk over to Farrer Park in Minutes! Alfian was a terrific host. He provided detailed instructions on checking in and checking out by e-mail and supplemented that with whatsapp messages. The place was clean and stocked with snacks to get us started after we checked in. It was really convenient to get to the MRT station which is within minutes of walking. The only thing I wish would be better is the bed. It was too soft. It almost sagged to the bottom as I sit on the side of the bed and did not provide any back support as I sleep.